The Best Place for learning Guitar in Nashik City. In case that you are looking for Guitar classes in cidco nashik, then you've arrived on best source for information. 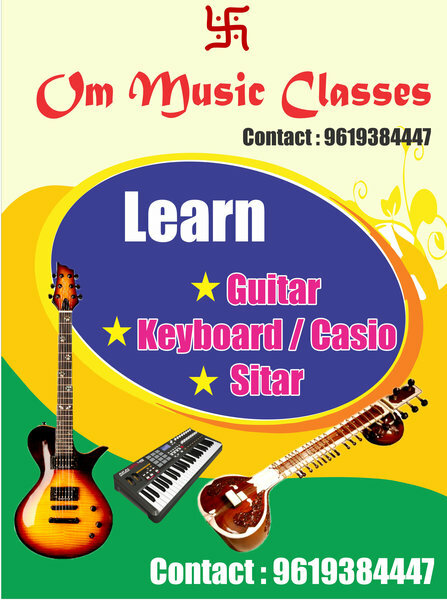 At Om Music Classes we educate you on Piano, Guitar and Sitar. Mr. Pravin Jadhav is widely recognized Music instructor.He is discovering music from past sixteen years and instructing knowledge of 8 + years. He is associated with Trinity School of Music and RGT. In the event that you are newbie or intermediate Piano / Guitar pupil you can join the training courses. Founded in 2007, Om Music Classes was began in an attempt to function music classes to students by Mr. Pravin Jadhav. Mr. Pravin Jadhav started his melodious journey as a kid. It has been eight wonderful years since he helping in this industry of music. Om Music Classes, in Cidco Nashik was established on 2007. The aim of the organisation was to become one of the main music instructing methods professionals in Nashik . We currently provide a advanced level learning facility in the heart of town. All programs are handy and begin each Month. Here is 100% placement assistance to our students. We also enjoy strong links with music organizations, which helps to make certain that our teaching is up to date and highly relevant towards the specifications of Music Industry. Om Music Class, a new undertaking that we are completely enthusiastic about. My thought is actually to make training of all types of Western music effortless, available, and pleasing to our planet's population. My perspective is simple- to deliver extreme top quality training in music through revolutionary methods while having a whole lot of fun. Get in touch with to find out more information on our Academy. No matter whether you're just beginning to learn music or can be an seasoned student, I can assure you that this experience of music learning and appreciation will certainly be attractive and very pleasing! Thanks. Near Pathardi Phata Cidco Nashik 422009 - Maharashtra - India . Contact : Pravin Jadhav 9619384447.